Various public sources tell us that Catherine Elizabeth ('Kate') Middleton, now Her Royal Highness the Duchess of Cambridge, descends from John Goldsmith (1827-88), a labourer who was born at Maidstone in Kent, and his wife Hester or Esther Jones (1832-85). John and Esther were married at Hoxton in the county of Middlesex in 1850. One of their grandsons, Stephen Charles Goldsmith (1886-1938), married Edith Eliza Chandler (1889-1971) at Uxbridge in Middlesex in 1909 and had three children, the youngest of whom, Ronald John James Goldsmith (1931-2003) was Kate Middleton's maternal grandfather. The England 1841 census shows the 14 year-old John Goldsmith living on Wheeler Street in Maidstone with his father, John Goldsmith snr, a 58 year-old carpenter, mother Rebecca Goldsmith (44), and four of his nine known siblings: Charles (23), Richard (21), Mary Ann (16) and Sophie Goldsmith (12). John Goldsmith's younger sister, Sophia ('Sophie') Goldsmith, was baptised at Boxley near Maidstone in 1829, and married a Pembury-born brickmaker, Henry Hickmott (1825-1914), at Hackney in Middlesex in 1848. Their wedding was witnessed by Sophie's siblings James and Mary Ann who, like their younger sister, signed the certificate with a cross or 'mark'. Henry was the youngest son of Samuel Hickmott (1799-c1872), a labourer and transportee, and Harriet Hartridge (1803-27). His elder brother, Edward Hickmott (1821-88) had married Sophie's older sister, Mary Ann Goldsmith (1824-91) at Maidstone in 1842. In May 1849 Henry and Sophie and their two daughters, Emma and Eliza Hickmott, sailed from London on the 580-ton barque EMILY. Their destination was Port Adelaide at which they arrived on 8 August 1849. A detailed account of the family's relatively brief time in South Australia can be read here. You will see that after spending some time at Onkaparinga, the family moved to Mount Barker in the Adelaide Hills where Henry probably worked in either Hombin's or McDonald's brickyards. 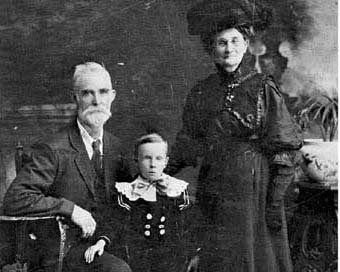 During this time he and Sophie had two further children: Rebecca Hickmott, born in around 1851, and Henry Edward Hickmott who was born at Mount Barker on 17 May 1852. Tragically, Sophie died either during or shortly after the birth of their only son (named after his father and uncle). We have yet to discover the exact circumstances of Sophie's death or where she is buried, something not unusual given the poor state of record-keeping in the colony at that time. With four small children to look after, Henry soon re-married, to Harriet Waters (1834-77), in Adelaide on 24 July 1853. Click here to read of Henry's life and times after Sophie's death. Nor do we have a photograph of Sophie Hickmott nee Goldsmith although we do have pictures of three of her four children whose life and times are outlined below. Born in England in around 1847, Emma sailed with her parents and sister from London to South Australia the following year. In 1866 she married a Cornishman, Richard Mitchell (1835-1927) in the Victorian goldfields town of Clunes. They had four children at Clunes before moving to East Charlton in the Victorian Wimmera. There Richard and his sons farmed land at Barrakee and Buckrabunyule and he and Emma had a further four children. Both Emma and Richard died and are buried at Charlton, she in 1914 and he in 1927. 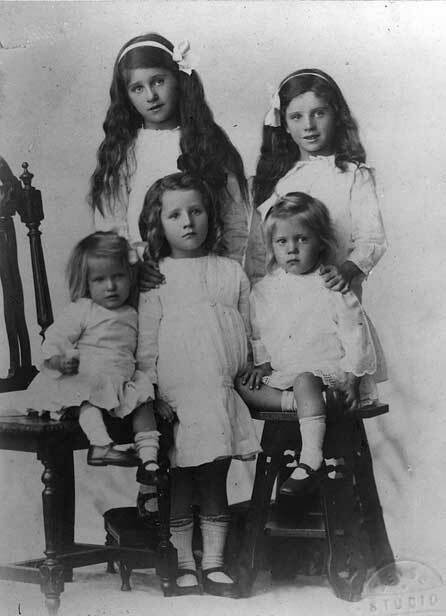 Their children, born between 1867 and 1889 were: Mary Sophia, Emma, Richard, John Henry, Alice Elizabeth, Florence Louise, Eliza Ruby and William James Mitchell. Click here to read more of their life and times. Baptised at Hackney St John in London on 26 April 1848, Sophie's second daughter, Eliza Hickmott (pictured on the left) was a mere infant when she and per parents and older sister, Emma, emigrated to Australia. She lived initially at Mount Barker in South Australia before moving with her father and step-mother to Clunes in Victoria in around 1854. She was only fifteen years and five months old when, in 1863, she married Robert Osborne (1830-1918), a saw miller, at nearby Coghill's Creek. Robert's death certificate shows he was 30 years old at the time and was born at Stow Bedon in Norfolk in England, the son of William Osborne and Rose Nuss. Although still to be confirmed, we think he sailed from Liverpool to Melbourne on the MORNING STAR which arrived at Port Philip on 20 September 1858. Eliza and Robert spent their married lives in the Clunes/Amherst/Eganstown area of central Victoria. At the time of the 1903 and 1909 elections they were living at Telegraph Hill on Mount Franklin near Eganstown. Robert was said to be working as a miner while Eliza was a nurse. As Rosemary Kennedy tells us, her nursing duties often went beyond the care of her patients. 'In 1904, one of my relatives, Mary Darcy from Borrisoleigh in Ireland, made out her Will. Eliza was a witness to the Will as was a local farmer Patrick Kelly (Borrisoleigh). Mary died in 1909 and is buried at the Roman Catholic Church in Eganstown. I am assuming that Eliza was a nurse to Mary as she was over 80 when she died. Mary was a farmer at Kangaroo Hills, a few kilometres from Blampied, near Eganstown'. Eliza Osborne nee Hickmott died at the Telegraph Sawmill near Eganstown in 1912 from the effects of influenza and bronchitis. She was then 64 years old. Her death certificate, which was informed by her youngest son Charles Stanley Osborne, states she was buried at the Burwood cemetery in Melbourne on 7 September 1912. She was said to have been born in London and had been 63 years in Australia, 56 of these in Victoria and seven in South Australia. Some time after his wife's death, Robert moved to the Melbourne suburb of Glen Iris where he died from the effects of cancer on 10 January 1918. Eliza and Robert Osborne had twelve children we are aware of between 1865 and 1890: William Henry, James Robert, Louisa Sophia, Emily, Rebecca, Emma Jane, John, Edith Rose, Alice Mary, George Alfred, Olive Eva Violet and Charles Stanley Osborne. Click here to read what we know about their respective lives and families. 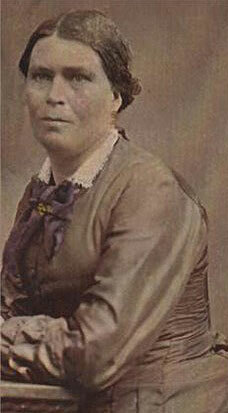 Eliza's older sister Emma Mitchell nee Hickmott). The man standing on the left may be Eliza's husband, Robert Osborne. George Alfred Osborne although this has not been confirmed. Sophie's third daughter was born in the Adelaide Hills (probably near Meadows) in April 1851. Three years later she sailed with her family from Adelaide to Melbourne and then travelled overland to Clunes in central Victoria. In 1869, she married a Cornishman, Joseph Colmer Smith (1832-1926). Their wedding certificate shows the wedding took place at the home of her brother-in-law, Richard Mitchell, Rebecca was then a 20 year-old spinster and Joseph a 33 year-old bachelor storekeeper from Waubra (then known as 'The Springs'). Joseph was the second son of Thomas Colmer and Jane Smith (nee Rowett) from St Austell in Cornwall. 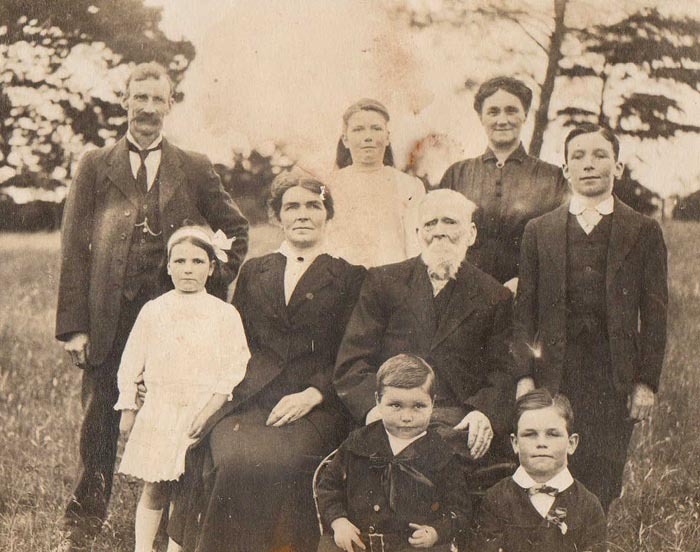 In 1849 Thomas and Jane and their five children emigrated to Australia on the GENERAL PALMER. The family disembarked at Adelaide and spent three years at Burra in South Australia before moving to Waubra in around 1852. A shopkeeper at Waubra, Thomas died and was buried at 'The Springs' on 7 October 1874. His wife Jane died at Ballarat in 1890 and is buried at Coghill's Creek. Information about Christopher and Selina and their family can be viewed on Tania King's Harrison Family of Waubra website. Rebecca acted as a mid-wife, delivering several babies in the Lalbert district [and] also helped neighbouring women in cases of illness or other emergencies. She also started Picnic and Sports days held on Boxing day at Lalbert Lake to enable people to get together. Horse racing was held on Joseph's property. Joseph took his wagon to Wycheproof to pick up supplies of food, etc. Possibly he brought back loading for other people as well. Joseph (pictured on the right) also carted and sold salt mined from a local lake. The 12 October 1887 edition of the East Charlton Tribune reported that a 'Mr Joseph Smith of L'Albert has left at our office a sample of the Lake Kunat Kunat salt. The salt which is easily gathered, is apparently of excellent quality, and can be sold at much cheaper rates than the imported article ... Mr Hickmott of this town will receive regular supplies of the Kunat Kunat salt from Mr Smith, and will always keep a good stock on hand'. Together with his brother-in-law Henry Edward Hickmott, who by then had also moved to Lalbert (see below), Joseph joined other town leaders in pressing the Victorian Department of Education to open a school in the area. Lalbert State School 2990 was subsequently opened in 1889 and six of its inaugural class of fifteen were children of Joseph and Rebecca. Sometime between 1909 and 1913 Joseph and Rebecca sold their farm at Lalbert and purchased another, which they named 'Green Hills', at Bolinda near Romsey in central Victoria. According to James Margetts, who sent it to us, the photo above of Rebecca standing behind the ornate chair was taken at Bolinda. Rebecca had written on the back of it: 'Green Hills. Bolinda Feb 12 1913. Dear Mr and Mrs Margretts [sic], with love to yourselves and baby. Hoping this finds you well. From your very sincere friend, Rebecca Smith'. James added that Rebecca 'was writing to my great grandparents, Frank and Rhoda Margetts, and the baby she is referring to is Frank James Margetts, who is my grandfather'. Rebecca Smith nee Hickmott died at the home of her daughter Selina Gamble (nee Smith) at 9 Walker Street in Northcote in Melbourne on 13 March 1914. Her death certificate, which was informed by her son-in-law John Charles Gamble, states she was 63 years old and had died of pneumonia following nine weeks of illness. Although her normal address at the time was Green Hills, Rebecca was buried at the Burwood cemetery on 14 March 1914. The electoral rolls show that after Rebecca's death, her husband Joseph remained for a time at Bolinda where he was helped with the farm by his sons George, Stanley and Percy (who eventually took over the running of the property). The 1924 electoral roll showed him living with his youngest daughter Mary Lilian Dowling and her husband at 5 Perth Street in the Melbourne suburb of Murrumbeena. At the time of his death on 6 July 1926, he was living at 16 Weerona Road in Murrumbeena. He was then 94 years old and died of senile decay and heart failure. Joseph Colmer Smith was buried at the Burwood Cemetery two days later. His death certificate records that he had been in Victoria for 81 years and at Waubra for 35 of these. Rebecca and Joseph Smith had fourteen children between 1870 and 1894: Emma Jane, Selina Sophia, Thomas Henry, William James, John Albert, Richard Colmer, Charles Christopher, Ernest Arthur, George Edward Rowett Gordon, Eliza Myrtle Auriel Pearl, Percy Herbert, Stanley Claude and Mary Lilian Isobel Smith (three of whom are shown in the photo directly below. Click here to read what we know about their lives and times. 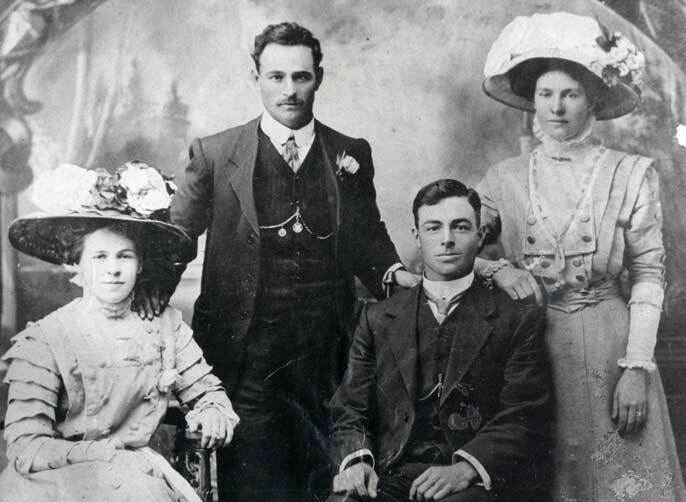 This photo is taken from Lisa Sukra's 'Smith Family Tree - Cornwall to Australia' located on Ancestry.com. Sophie's only son was born at Mount Barker in South Australia in 1852 but grew up in the Victorian country towns of Clunes and Charlton. On 24 April 1877 he married, at Kingower near Bendigo, Elizabeth Ann Owen (1855-1923), the older sister of his good friend and cricketing colleague from Charlton, John Richard Owen. Elizabeth was born at Emerald Hill in Melbourne in 1855, the only daughter of Edward and Elizabeth Owen nee Evans who had sailed from Liverpool to Port Philip on the LORD STANLEY in 1852. No doubt lured by the news of fresh discoveries of gold in the Kingower/Inglewood region, Edward, or Taffy as he was known, and his family moved from Melbourne to Bet Bet near Dunolly in around 1857 and then on to Kingower. The old couple appear to have remained at Kingower through the town's boom and bust periods, seeing the local population peak at around 8000 in the 1860s before steadily declining to under 100 by the time of Edward's death there in 1908. Henry and Elizabeth (pictured below on the left) spent their early married life at East Charlton which then boasted two mills, two restaurants and no less than five hotels including Klug's East Charlton Hotel and the Cricket Club Hotel. It is likely that Henry, his half brothers James and William, and brother-in-law John Richard Owen frequented the second of these establishments, if not for imbibing or playing billiards, then certainly for planning and issuing challenges to such opposing cricket teams as St Arnaud, Mount Jeffcott and Buckrabunyule. Unlike John Owen, who was thought by his descendants to play for Victoria, Henry was what was described by the East Charlton Tribune as a 'trundler' who sometimes 'disturbed the peace' of his opponents' 'timberyard' and, very occasionally, scored a few runs. Perhaps his most notable performance was against St Arnaud on 20 October 1879, where he took 2/19 and participated in a last wicket stand which resulted in an historic win over East Charlton's arch rivals. The joy of winning was to be short lived, however, as East Charlton, and Henry's bowling, were thrashed in a return match held at St Arnaud a couple of weeks later. This pug mill is for the purpose of effecting a uniform consistency to the clay before it is moulded for brickmaking, and by this invention the clay is thoroughly mixed. I obtain this valuable result by securing knives to the vertical shaft of the pug mill, and these knives revolve almost immediately over and above a fixed plate, which is meshed to a gauge of about 21�2 inches, and the action of the knives is to force the clay through these meshes. After the clay has passed through the upper mesh it is subjected to a pulverising treatment by means of vertical revolving pegs or pugs, which are secured to horizontally re-volving arms bolted to the central shaft. The clay is afterwards again forced through another meshed plate, and is ready for moulding into bricks. I may use any number of meshed plates and knives to suit the nature of the different clays; also the meshes are arranged for this purpose. A better and more consistent brick is obtained by pugging the clay with this invention ; also the brick is more dense and solid. An order for a mill fitted with this invention has already been obtained by the inventor and patentee. Mr HENRY HICKMOTT, GUILDFORD POST-OFFICE. leaving for Western Australia in 1909 (Arthur died in a shooting accident at Brookton in 1922). 2. 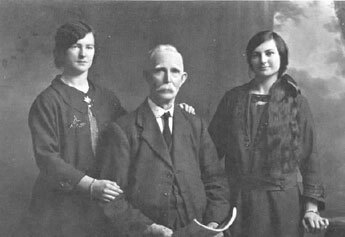 Henry Edward and granddaughters Melva and May (taken in Western Australia in the 1920s). In spite of these interests, Henry and Elizabeth decided, in around 1909, to sell up and move to Western Australia. They were accompanied on the journey by a number of their children and would be joined by a number of others who had either earlier travelled to the west or would do so once their parents had re-settled. They purchased a farm, which they named 'Dingley Dell', eight miles east of the inland town of Brookton. Their new property was 1357 acres in size and was watered by a well and 'several good soaks'. By the time it was first offered for sale in 1950, it had been fully fenced and had on it a four-room stone house and adjoining stables. As he had done at Lalbert, Henry soon became actively involved in the local community, serving as a founding member of the Brookton Farmers and Settlers Association and its President for two years, and a patron of the Brookton Swimming Club. 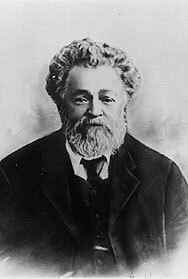 On 21 October 1914, he was elected as the Country Party member for the electorate of Pingelly in the Western Australian Parliament where he sat for three terms before being defeated at the 1924 election. Click here to read a detailed account of his time as a Member of the WA Legislative Assembly. During the First World War Henry served on the Brookton Repatriation Committee which raised funds and other support for the soldiers and their dependents and helped returned men find employment. Throughout this time he retained his lifelong interest in cricket even participating in a match between WA's Parliamentarians and the press corps in 1921. 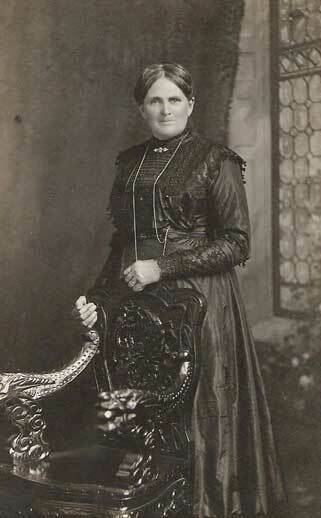 On 16 April 1923, Henry Edward's wife, Elizabeth, died while visiting their son William Henry and his family at Ouyen in Victoria's mallee district. Two years later Henry married Sarah Ellen ('Nellie') Clarke, the daughter of Alfred and Emma Clarke, in Perth. On Sunday 18 January 1931, Henry Edward was killed when he was thrown from a cart he was riding in while laying rabbit poison on his property. The cart hit a stone and he was thrown to the ground, breaking his neck in the fall. 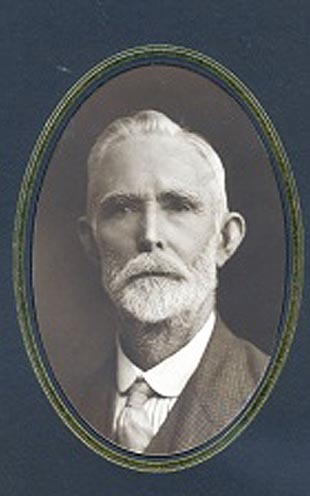 His funeral took place the following day and he was buried in the Methodist section of the Brookton Cemetery. Henry and Elizabeth Hickmott nee Owen had twelve children between 1879 and 1903: Sophia Elizabeth, John Edward, Edward James, Florence Mary, Alice Ann, Edith Olive, William Henry, George Alfred, Ruby Minnie, Ella Adeline, Rebecca Elsie and Jamres Arthur. Click here and here to read of their lives and families. (from R/L): Florence Evelyn, Muriel Edith ('Judy') and Elsie May Hickmott. 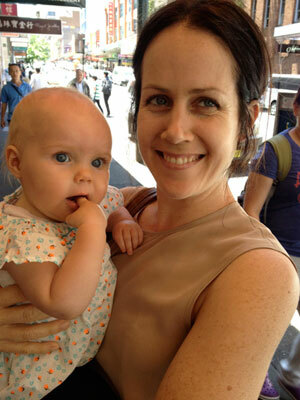 Brianna Cheeseman (nursing her niece, Prince George's fifth cousin, Sunny Breen).